Black Mirror – Bandersnatch from Netflix has got everyone talking. While the interactive viewing experience is an unparalleled-first, many are concerned about the data gathered based on the viewing choices they’ve made, and how Netflix can leverage that information in the future. Others believe this is the beginning of product placements done smartly. For example, right at the beginning, the viewer must choose between Kellogg’s Frosted Flakes and Sugar Puffs to proceed with the story. Despite the ongoing debates and discussions, this choose-your-own style of storytelling is an early indicator of the way users will consume digital content in the future. This trend is not limited to Over The Top content platforms (OTT). This could spill over to the way brands choose to deliver marketing communication to their audiences. Delight customers with personalized journeys: Netflix says that Bandersnatch has five different endings and trillions of permutations to the narrative. This means that no two viewers are likely to have a similar viewing experience. This is the biggest lesson for marketers who try to customize marketing communication. Target group or segment level customization might not be effective anymore. Marketing automation technologies have armed marketers with the capability to build 1:1 personalized engagement at scale. Automating customer journeys across channels and ensuring a unique experience is imminent to convert online store visitors into shoppers. For example, Tokopedia, Indonesia’s leading ecommerce company has implemented a unique app user onboarding strategy. The brand automates their app user’s journey right from the first visit until the purchase to ensure continued engagement and eventually conversions. The brand does this by mapping the key milestones in a user’s purchase journey and triggers personalized communication without being intrusive to the user’s overall brand experience. Each user has a unique way to engage with the brand. Win more customers by providing an experience that is both unique and human-like. Cross-channel User Engagement and How Tokopedia Does It Right from MoEngage Inc.
A seamless experience is often more engaging: One thing that everyone agrees about Bandersnatch is the seamless viewing experience it offers. No matter which option selected at various points in the story, the switch is both smooth and natural. As marketers strengthen channels such as web, app, social, and add more to the mix like chatbots – customers journeys tend to get complicated. It is critical that organizations offer a seamless experience for users at all touch-points. 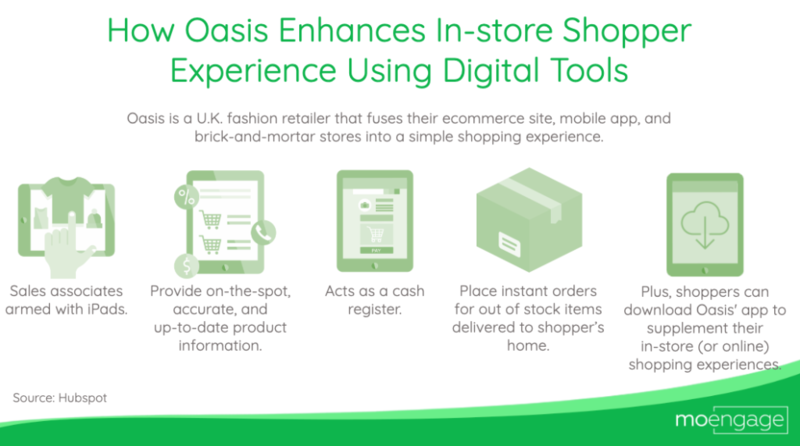 For example, Oasis, a fashion retailer in the U.K. combines their ecommerce site, mobile app and brick-and-mortar shop to offer a seamless shopping experience. When a customer walks into the retail store, the sales associates offer on-the-spot product information using an iPad. If the product is out of stock, it is ordered online and shipped to the customer directly. Whether it is personalizing digital conversations or enabling in-store sales teams, brands should invest in technologies that help them understand their shoppers better. Be prepared and cover all bases: If a viewer did not make any choices while watching Bandersnatch, Netflix will. They’ve also laid out various permutations and combinations and the narrative for each choice. Ecommerce and retail marketers need to visualize the various branches in customer journeys and be able to map out specific triggers for each. For example, what happens when a user looks at t-shirts on a website and then browses bags within the store’s app? How can brands re-engage users who turn dormant in the middle of automated flows? Be prepared for various eventualities and ensure built-in custom engagement paths for each. This will not just help plug the leaks in funnels, but also create customer trust. However, this is not a one-time job. It is important to include periodic reviews and analytics into all marketing practices. This will improve marketing effectiveness and allows brands and organizations to stay relevant to an ever-evolving customer-base. Netflix never ceases to entertain and with this new interactive storytelling, they’ve raised the bar for personalization to the next level. Has this brand-new method of storytelling created inspiration? Let us know your thoughts and feedback in the comments section below. The post 4 Ecommerce Marketing Takeaways from Netflix’s Black Mirror – Bandersnatch appeared first on Get Elastic Ecommerce Blog.